There are a lot of options to help you build a website. Website builders, like Wix, SquareSpace, and Weebly, offer a DIY (do-it-yourself) functionality that allows you to build a website without coding expertise. With website building now easier than ever, a new survey by Clutch, a research and reviews platform for business services, finds that many website builder users are using these DIY tools to create sites for business use. Out of 307 respondents who built a website using DIY web builders, 42% indicated that their website was built for business purposes such as having an online business presence, increasing online sales, or facilitating e-commerce. 48% say that they built their site for personal use such as for a photo gallery, creative display, portfolio, or a blog. Clutch's findings illustrate that creating a website is more accessible and popular for individuals and small businesses than it's ever been before. Of those surveyed, 63% say they have an "intermediate" familiarity with website builders, a level that indicates they have set up a website, including advanced features, without assistance. 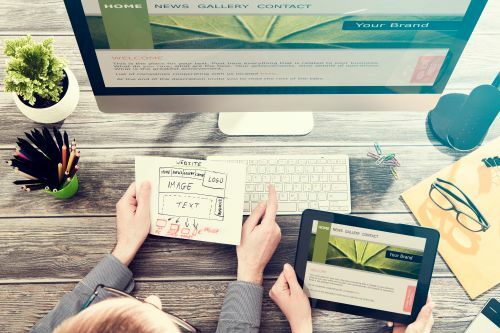 "Website builders have come a long way from a decade ago when a blogger or personal user would dabble with a website builder just to get their presence online," says Evan Brown, Marketing Manager at Designmantic.com, a web design company. "Today, many of these tools offer features like hosted services, domain registration, search engine optimization capabilities, responsive web design, and e-commerce integration, making it easy for businesses to hop online in no time." Clutch's survey also found that DIY websites built for business purposes are more complex than any other type, and that individuals who create a website for business are looking to use that site in a more advanced way – by generating interactions and conversions. For a website to be complex, it must include five or more integrations, according to Clutch's analysis. The most popular web builder integrations are social media (64%), customer reviews (55%), and calendar/scheduling tools (45%). The data reveals that out of the respondents who built a website for business, 46% integrated five or more tools. Comparatively, only 27% of respondents with a personal website integrated the same amount of tools. The complexity of business websites may impact the ability of DIY web builders to serve business needs. Although DIY web builders have made the features and integrations they offer more advanced in recent years, these tools still may not be enough for a small business seeking significant online growth. For SMBs who want to establish a strong online presence for their business, Clutch recommends considering solutions beyond DIY web builders. For example, small businesses may see increased success in generating online leads and conversions by transferring their website to a content management system (CMS), or hiring a design expert. With these alternative solutions, small businesses will be able to benefit from the guidance of a professional, instilling confidence that they are building custom, flexible, and successful websites that serve their advanced needs. Clutch also used customer feedback to rate the top 10+ website builders. You can find the full research and reviews here: https://clutch.co/website-builders. Clutch's 2017 Website Builder Survey included 307 full-time SMB employees and users of DIY website builders. 30% of respondent companies have an annual revenue of less than $1 million. Data was collected throughout December 2016.